I was always a lover of soft-winged things. Birds are theropod dinosaurs characterized primarily by feathers, forelimbs modified as wings, and toothless beaks. "The beauty and genius of a work of art may be reconceived, though its first material expression be destroyed; a vanished harmony may yet again inspire the composer; but when the last individual of a race of living things breathes no more, another heaven and another earth must pass before such a one can be again". Early 20th century ornithologist and naturalist, Charles "William Beebe", The Bird: Its Form and Function (1906). Robert Burton, The Anatomy of Melancholy (1621), Part III, Section I. Memb. 1, Subsect. 2. Miguel de Cervantes, Don Quixote (1605-15), Part I, Chapter IV. Miguel de Cervantes, Don Quixote (1605-15), Part II, Chapter LXXIV. "I love my Love, and my Love loves me!" Samuel Taylor Coleridge, Answer To a Child's Question (1802). Along the waves dost thou fly? Through this fair land rejoice! Richard Henry Dana, The Little Beach Bird, reported in Hoyt's New Cyclopedia Of Practical Quotations (1922), p. 57. Observe intently the birds of heaven, because they do not sow seed or reap or gather into storehouses; still YOUR heavenly Father feeds them. Are YOU not worth more than they are? Jesus, Matthew 6:26, New World Translation. Shaw Neilson, The Crane is My Neighbor (1934). William Shakespeare, King Henry IV, Part II (1597–8). Last lines. See also Mahomet's pigeon, the "pious lie", Life of Mahomet in Library of Useful Knowledge, note p. 19. Aristophanes, Aves. See Robinson's Antiquities, Greek, Book III, Chapter XV. ad init. Ecclesiastes. X. 20. There are people who love birds so much they free them. There are others who love them so much they cage them. Gene Wolfe, The Book of the Long Sun, Volume 3: Caldé of the Long Sun (1994), Volume 3, Ch. 4. I do not be­lieve birds deserve to be put in a taxo­nomic class separate from dinosaurs. 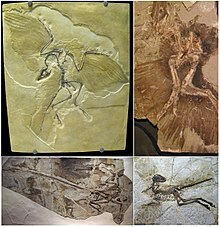 When it was assumed that birds did not evolve from dinosaurs, it was correspondingly presumed that their flight evolved among climbers that first glided and then developed powered flight. This has the advantage that we know that arboreal animals can evolve powered flight with the aid of gravity, as per bats. When it was realized that birds descended from deinonychosaurs, many researchers switched to the hypothesis that running dinosaurs learned to fly from the ground up. This has the disadvantage that it is not certain whether it is practical for tetrapod flight to evolve among ground runners working against gravity. The characteristics of birds indicate that they evolved from dinosaurs that had first evolved as bipedal runners, and then evolved into long armed climbers. If the ancestors of birds had been entirely arboreal, then they should be semiquadrupedal forms whose sprawling legs were integrated into the main airfoil, like bats. That birds are bipeds whose erect legs are separate from the wings indicates that their ancestors evolved to run. Quotes reported in Hoyt's New Cyclopedia Of Practical Quotations (1922), p. 69-70. Gavin Douglas, Morning in May. A bird of the air shall carry the voice, and that which hath wings shall tell the matter. Thomas Gray, Sonnet on the Death of Richard West. A feather in hand is better than a bird in the air. But I love him best of all. Our hearts and lips together. Can I, ah! can I, e'er know repose? Karl Herrlossohn, When the Swallows Homeward Fly. Victor Hugo, I Was Always a Lover. A rare bird upon the earth, and exceedingly like a black swan. Do you ne'er think what wondrous beings these? Alone are the interpreters of thought? Sweeter than instrument of man e'er caught! Henry Wadsworth Longfellow, Tales of a Wayside Inn (1863-1874), The Poet's Tale, The Birds of Killingworth. Martial, Epigrams (c. 80-104 AD), Book XIV, Epistle 67. Bears the Cross upon its wings. Ascribed to John Mason Neale. With joyous musick wake the dawning day! Alexander Pope, Pastorals, Spring, line 23. That fylythe hys owne nest. John Skelton, Poems against Garnesche, III. But shadows ever man pursue. Elizabeth Barrett Browning, The Sea-Mew. William Cullen Bryant, To a Water Fowl. At once o'er the waves on their stormy wing! Barry Cornwall, The Stormy Petrel. A glove of challenge on the salt sea-flood. Dafydd ap Gwilym, "Yr Wylan" (To the Sea-gull), line 1; translation from Robert Gurney (ed. and trans.) Bardic Heritage (London: Chatto & Windus, 1969) p. 130. Algernon Charles Swinburne, Songs of the Spring Tides, introductory lines to Birthday Ode to Victor Hugo. Samuel Taylor Coleridge, The Rime of the Ancient Mariner (1798; 1817), Part I, Stanza 18, reported in Hoyt's New Cyclopedia Of Practical Quotations (1922), p. 19. E'en sleeping on the wing. Charles G. Leland, Perseverando, reported in Hoyt's New Cyclopedia Of Practical Quotations (1922), p. 19. Thomas Moore, Lalla Rookh, The Veiled Prophet of Khorassan; reported in Hoyt's New Cyclopedia Of Practical Quotations (1922), p. 70. The meagre food that scarce thy want allays! And hard perversion of her creatures' ways! Thy bill, that now with pain scant forage earns. Julian Fane, Poems, Second Edition, with Additional Poems, To a Canary Bird; reported in Hoyt's New Cyclopedia Of Practical Quotations (1922), p. 89. Passes in a narrow cage. Dinah Craik, The Canary in his Cage; reported in Hoyt's New Cyclopedia Of Practical Quotations (1922), p. 89. Bird of the golden wing! Edmund Clarence Stedman, The Songster, Stanza 2; reported in Hoyt's New Cyclopedia Of Practical Quotations (1922), p. 89. Of course the Neverlands vary a good deal. John’s, for instance, had a lagoon with flamingoes flying over it at which John was shooting, while Michael, who was very small, had a flamingo with lagoons flying over it. J. M. Barrie, Peter Pan (1904), Ch. 1 : Peter Breaks Through. The Jackdaw sat in the Cardinal's chair! And they served the Lord Primate on bended knee. Than the Cardinal Lord Archbishop of Rheims. R. H. Barham, Ingoldsby Legends, The Jackdaw of Rheims; reported in Hoyt's New Cyclopedia Of Practical Quotations (1922), p. 402. An old miser kept a tame jackdaw, that used to steal pieces of money, and hide them in a hole, which a cat observing, asked, "Why he would hoard up those round shining things that he could make no use of?" "Why," said the jackdaw, "my master has a whole chestfull, and makes no more use of them than I do." Jonathan Swift, Thoughts on Various Subjects; reported in Hoyt's New Cyclopedia Of Practical Quotations (1922), p. 402. What, is the jay more precious than the lark, Because his feathers are more beautiful? William Shakespeare, The Taming of the Shrew (c. 1593), Act IV, Scene 3, line 177. James Beattie, Vergil, Pastoral 6; reported in Hoyt's New Cyclopedia Of Practical Quotations (1922), p. 427. Geoffrey Chaucer, The Parlement of Fowles, line 47; reported in Hoyt's New Cyclopedia Of Practical Quotations (1922), p. 427. Oliver Goldsmith, The Deserted Village (1770), line 44; reported in Hoyt's New Cyclopedia Of Practical Quotations (1922), p. 427. Close by the ground, to near our conference. William Shakespeare, Much Ado About Nothing (1598-99), Act III, scene 1, line 25; reported in Hoyt's New Cyclopedia Of Practical Quotations (1922), p. 427. "I'd rather you shot at tin cans in the back yard, but I know you'll go after birds. 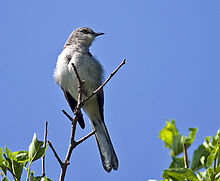 Shoot all the bluejays you want, if you can hit ‘em, but remember it's a sin to kill a mockingbird." That was the only time I ever heard Atticus say it was a sin to do something, and I asked Miss Maudie about it. “Your father's right," she said. "Mockingbirds don't do one thing but make music for us to enjoy. They don't eat up people's gardens, don't nest in corncribs, they don't do one thing but sing their hearts out for us. That's why it's a sin to kill a mockingbird." Harper Lee, To Kill a Mockingbird (1960), Pt. 1, ch. 10. Henry Wadsworth Longfellow, Evangeline: A Tale of Acadie (1847), Part II, Stanza 2, reported in Hoyt's New Cyclopedia Of Practical Quotations (1922), p. 520. Winged mimic of the woods! thou motley fool! Who shall thy gay buffoonery describe? Arch-mocker and mad abbot of misrule! Robert Wilde, D.D., Sonnet, To the Mocking-Bird, reported in Hoyt's New Cyclopedia Of Practical Quotations (1922), p. 520. Loves of his own, and raptures swell the note. Alexander Pope, An Essay on Man (1733-34), Epistle III, line 33. William Shenstone, Valentine's Day; reported in Hoyt's New Cyclopedia Of Practical Quotations (1922), p. 460. Alfred Tennyson, In Memoriam A.H.H. (1849), Part XXI, Stanza 6. On the dead tree, a dull despondent flock. James Thomson, The Seasons (1726-30), Autumn, line 974. William Wordsworth, The Green Linnet; reported in Hoyt's New Cyclopedia Of Practical Quotations (1922), p. 460. Lord Byron, Don Juan (1818-24), Canto XIII, Stanza 75, reported in Hoyt's New Cyclopedia Of Practical Quotations (1922), p. 580. Viewing the towering falcon nigh? Nor would she stay; nor dares she fly. Matthew Prior, The Dove, Stanza 14, reported in Hoyt's New Cyclopedia Of Practical Quotations (1922), p. 580. William Shakespeare, Henry VI, Part II (c. 1590-91), Act III, scene 2, line 191. With greedy jawes her ready for to teare. Edmund Spenser, The Faerie Queene (1589-96), Book III, Canto VIII, Stanza 33. Fesaunt excedeth all fowles in sweetnesse and holsomnesse, and is equall to capon in nourishynge. Sir T. Elyot, The Castle of Helth, Chapter VIII; reported in Hoyt's New Cyclopedia Of Practical Quotations (1922), p. 594. The fesant hens of Colchis, which have two ears as it were consisting of feathers, which they will set up and lay down as they list. Pliny the Elder, Natural History, Book X, Chapter XLVIII, Holland's translation; reported in Hoyt's New Cyclopedia Of Practical Quotations (1922), p. 594. Alexander Pope, Windsor Forest (1713), line 111; reported in Hoyt's New Cyclopedia Of Practical Quotations (1922), p. 594. And thou shalt make him couche as doeth a quaille. Geoffrey Chaucer, The Clerke's Tale, line 13,541, reported in Hoyt's New Cyclopedia Of Practical Quotations (1922), p. 652. Only the empty nests are left behind. Henry Wadsworth Longfellow, The Harvest Moon, reported in Hoyt's New Cyclopedia Of Practical Quotations (1922), p. 652. An honest fellow enough, and one that loves quails. William Shakespeare, Troilus and Cressida (c. 1602), Act V, Scene 1, line 58. Dinah Craik, Thirty Years, The Blackbird and the Rooks; reported in Hoyt's New Cyclopedia Of Practical Quotations (1922), p. 677. James Thomson, The Seasons, Spring (1728), line 756. Thomas Warton, Ode X; reported in Hoyt's New Cyclopedia Of Practical Quotations (1922), p. 677. One little sand-piper and I.
Celia Thaxter, The Sand-Piper, reported in Hoyt's New Cyclopedia Of Practical Quotations (1922), p. 690. Lord! how sullen he would be! William Cartwright, Lesbia and the Sparrow; reported in Hoyt's New Cyclopedia Of Practical Quotations (1922), p. 740. Their race in Holy Writ should mentioned be. Henry Wadsworth Longfellow, Tales of a Wayside Inn (1863-1874), The Poet's Tale, The Birds of Killingworth, Stanza 2. William Shakespeare, King Lear (1608), Act I, scene 4, line 235. William Wordsworth, The Sparrow's Nest; reported in Hoyt's New Cyclopedia Of Practical Quotations (1922), p. 740. Thomas Hardy, The Darkling Thrush (1900), from Poems of the Past and Present. The Western Gull is a common gull from the Pacific coast of the United States. Could the whip-poor-will or the cat of the glen/Look into my eyes and be bold? Elizabeth Barrett Browning, The Runaway Slave at Pilgrim's Point (published in The Liberty Bell, 1847-48), lines 55-56. The moan of the whip-poor-will from the hillside; the boding cry of the tree-toad, that harbinger of storm; the dreary hooting of the screech-owl. Washington Irving, The Legend of Sleepy Hollow; reported in Hoyt's New Cyclopedia Of Practical Quotations (1922), p. 868. In forest's depths is heard thy note. Marie Le Baron, The Whip-Poor-Will; reported in Hoyt's New Cyclopedia Of Practical Quotations (1922), p. 868. And then the wren gan scippen and to daunce. Geoffrey Chaucer, Court of Love, line 1,372; reported in Hoyt's New Cyclopedia Of Practical Quotations (1922), p. 921. Hung idly in the summer air. Dinah Craik, The Wren's Nest; reported in Hoyt's New Cyclopedia Of Practical Quotations (1922), p. 921. William Shakespeare, Macbeth (1605), Act IV, scene 2, line 9; reported in Hoyt's New Cyclopedia Of Practical Quotations (1922), p. 921. Tatler, No. 224; reported in Hoyt's New Cyclopedia Of Practical Quotations (1922), p. 921.